Feel free to scroll down (or click here) if you want to go straight to the guide. Otherwise, here's how I got into a traffic violation. I was 10 minutes away from my destination when the stoplight at the Quirino-Taft intersection in Manila turned red. While stopped, I looked at my watch and saw the time was 7:05am. Glancing from my watch back to the road, I saw a female MMDA traffic officer walking towards my car. I was hoping she was just going to cross the road. She did cross one lane, then stopped right in front of my car and made a hand gesture to her wrist. I knew immediately what she meant. I politely said good morning and immediately in defense, said that I left early but traffic delayed my trip. She told me it's 7:05am and coding scheme has started. I said I'm aware but asked for some leeway due to the unavoidable circumstances. In addition, I told her my destination is near and hoping she won't need to issue me a violation. She hurried me to surrender my driver's license. I said, I'll pull the car over to the side first to avoid causing traffic. I guess enforcers get that often and get duped when drivers drive on and never look back. So I gave my driver's license and then parked at the curb across the intersection and waited for her to approach me. She had her huge ticket violation booklet with her. At this point, there was no point in reasoning, so I just said sorry. Being my first time to be pulled over for a traffic violation in Manila, I immediately asked the officer how soon I could get my license back. 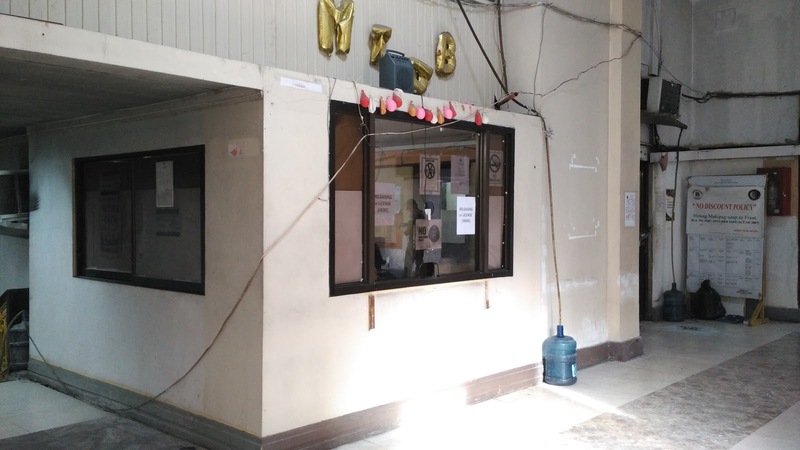 She said to claim it at Manila City Hall within 5 days and said Monday is the latest. Her explanation didn't sum up since 5 days equated to Tuesday plus I asked if weekends are counted. She just stuck with her original answer and decided not to argue over specifics. I did say that I want to get my license back as soon as possible and said I'll go to City Hall in the afternoon. She said it won't be available then cause she'll be going back to City Hall around 2pm and will just start to encode all the traffic violations made for that morning. After issuing me a ticket, she said I don't need to rush anymore since I was already caught. If that was supposed to make me feel any better, it didn't. Her last piece of advice was to be careful not to make any other traffic violations outside Manila cause the ticket she gave me served as a temporary license only for Manila. So if I get caught in Makati, I'll be issued another ticket but with a heavier penalty for driving without a license. I said thank you to the officer and half-heartedly greeted "have a nice day," cause I already knew that wouldn't apply to my morning. I didn't want this to dampen my whole day so I decided not to think about it and just get it the next day. Cross the street and walk to the right. 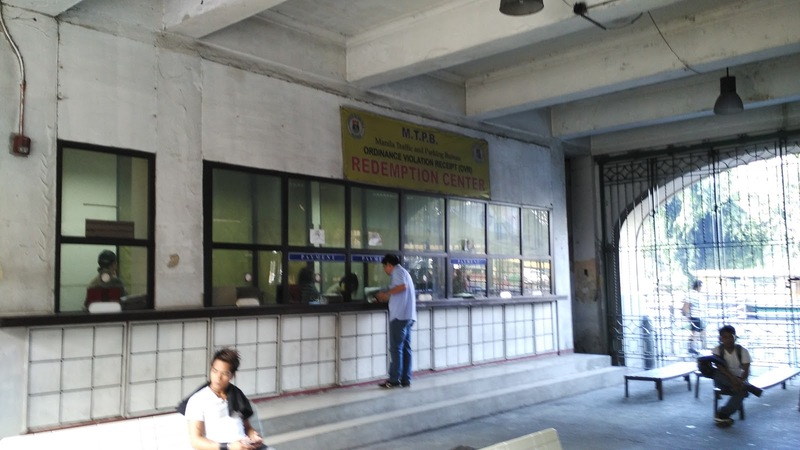 Take the nearest entrance to City Hall and walk straight till you reach the Manila Traffic and Parking Bureau "Ordinance Violation Receipt" Redemption Center. You'll notice that nobody wants to be here so don't expect any happy faces or smiles. Step 2: Pay fine to cashier. Claiming your driver's license is a 3-step process. 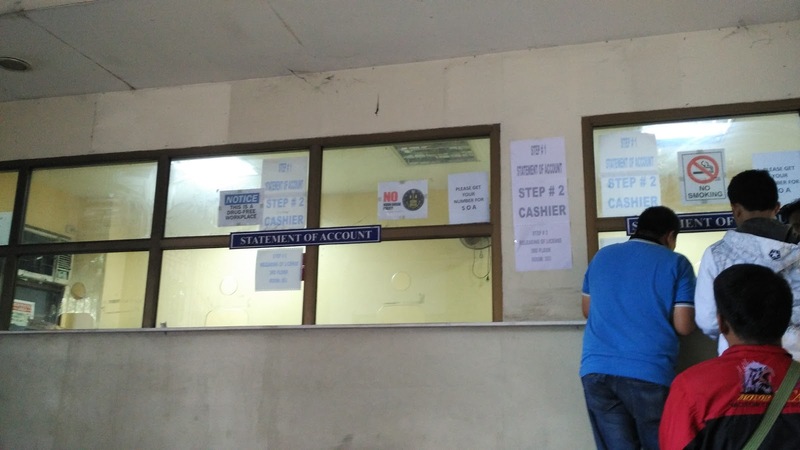 First step is to go to the Statement of Account windows (to the right) to submit your traffic violation ticket. You'll be issued a number which you'll be called. They open at 8am but issue numbers before they open. I was 10th in line so it didn't take long. 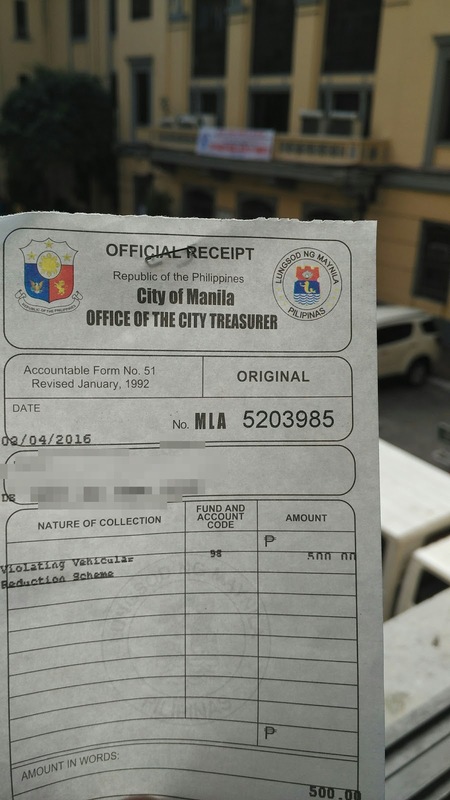 They'll call your number and give you a printout with your violation details and conveniently lists your name as "Violator" The fine for violating vehicular reduction scheme (their term for coding) is P500. They'll issue you a receipt after payment. The last step is to proceed to Room 353 (Releasing of License) on the 3rd floor. Give your Statement of Account printout (from Step 1) and wait for your number to be called. This was the longest waiting time of the 3 steps, which took around 20 minutes. It's hot at the 3rd floor so bring a fan. While waiting, be sure to go to the nearest window and take time to admire the Manila City Hall clock tower. You can also compare notes with other "violators" (like new prisonmates asking what you're in for). When called, you'll be shown your driver's license. As soon as you see your name and face, give them a thumbs up or nod (cause there's thick glass separating you from them). You'll be asked to sign the Statement of Account, which they'll retain and that's it! You can start smiling while taking the stairs 3 floors down. The whole process for me took only 30 minutes. For reference, there were 10 "violators" ahead of me during the entire process. I suggest to be there before 8:00am. Despite the quick turnaround processing, it's still a hassle to get your license confiscated and go to City Hall to claim it. So be safe and avoid violating traffic rules as much as possible.